Are you ready for a steampunk action? 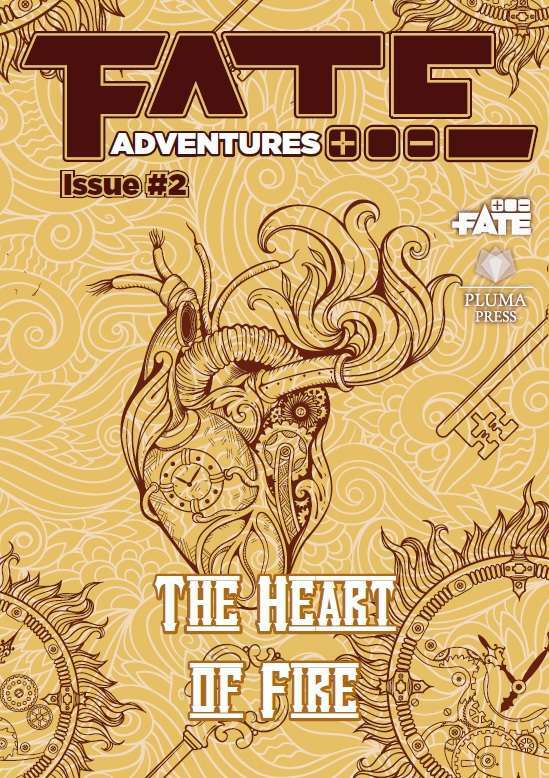 The Heart of Fire is a steampunk adventure set in the Old West (19th century). Several steam powered machines, including conscious automata, are part of daily life. The rise of cities collided with the traditions of indigenous tribes. Disputes over territory are constant. Justice is maintained by the Sheriff and Patrolmen (PCs), who routinely confront the outlaw. A one-shot steampunk adventure for Fate Core and Fate Accelerated (FAE). Fate Adventures and Fate Plus is a monthly zine that creates new ideas, adventures, tools, and new rules for Fate Core and FAE (Fate Accelerated). Adventure Plus and Fate Plus was originally published in Brazilian Portuguese. Now it's getting its English version. We're at Patreon, publishing new material on issues with about 7000 words of original content every month. Support our work! If you find some typo, incorrect grammar or rules mistakes, you can contact us through our Patreon. I think you really should provide more info on your adventure products. The previous one was just "one-shot survival adventure" and this one is just "one shot steampunk adventure." Generic descriptions don't sell products. Please tell us how your adventure modules are awesome and why we should buy them. Thanks. Thank you for your comment David R. We are including detailed description on all products. Is there just a PDF version?